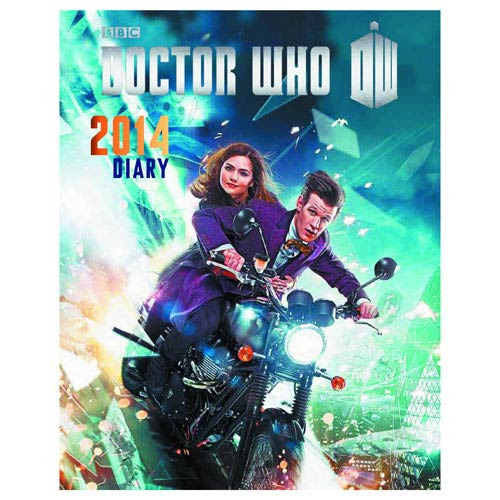 The Doctor Who 2014 Daily Planner! Covers the first 5 episodes of season 7 of Doctor Who. Includes episode synopsis with images and descriptions of characters and monsters throughout! Covering the first 5 episodes of season 7 of the BBC TV show Doctor Who, this Doctor Who 2014 Daily Planner finds Matt Smith's 11th doctor and his companions Amy Pond and Rory Williams taking on Daleks in a Dalek asylum, adventuring in the Old West, and diving deep into the ocean in a Russian submarine in 1983. Featuring appearances by the Weeping Angels, the Ice Warriors, and the Cybermen, the Doctor Who 2014 Daily Planner has got it all! Includes a synopsis for each of the first 5 episodes of season 7 with images and descriptions of characters and monsters throughout. Double-page spread, per week format. Measures about 9 1/2-inches tall x 7 1/2-inches wide.